In today’s world, internet is the key to everything. Whether it is a business or educational material, everything is working as well as accessible through internet. For making websites accessible to both non-disabled as well as disabled people, the concept of Web Accessibility was introduced. 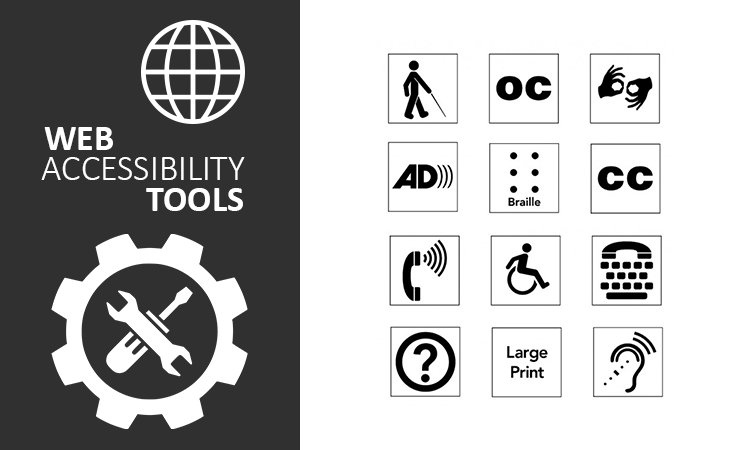 Basically in web accessibility, various practices are followed to make websites easily accessible to disabled people as well, irrespective of the technology being used by them for browsing. This is helpful in abiding to the law as well as in increasing the number of active visitors to your websites, thus benefiting your business. Two things that have taken the world by storm & have become an essential part of everyone’s life are the internet and the websites. Internet is being utilized to access websites, not just for information but for every other essential task like shopping, watching videos, interacting with friends around the globe, meeting new people, studies and an endless list of other things. Use of internet has opened so many possibilities and solutions to our daily problems, making it one of the most essential things in our lives today. But still, it is disappointing to note that these websites cannot be accessed by everyone, for example the people with disabilities. The websites are not created keep the disabled in mind, which makes it very hard for these people to access web. In this world, there’s a huge part of the population with disabilities like vision problems, hearing issues, dyslexia, physical disabilities etc. These people are not able to access these websites which are developed without keeping disabled in mind. But with introduction of web accessibility, using the websites and internet has become a lot easier. This is a feature that should be taken care of by the web designers and companies so that everyone feels equal. Web accessibility has been introduced as a savior in such kind of situations, letting the disabled people even access all the functionalities and features of web world. The problems don’t end with this as most of the people use internet and websites on their mobile phones. Thus, if a website is not designed keeping the mobile phone devices and accessibility in mind then this can cause these issues more. Due to the drastic increase in users of smart phones and internet users, responsive websites are being created which are auto-adjustable according to the device screen size. There are number of ways to access websites, like we can use laptops and even use our smart phones. To access web from these devices, various applications are used like web browsers, email applications, news applications, messenger, multimedia player applications etc. With so much of technologically advancement, it becomes really essential to make web accessible to everyone. Even the smart phones being launched these days have the accessibility options for increasing the usability for disabled people. Thus, web designers and companies should not overlook these people while creating websites so that it feels fair for everyone. With the advancement in the field of technology, it has become very easy to add web accessibility to the websites but this is not understood by most of the web designers and industries. This not only causes them to lose a huge amount of traffic but also large amount of revenue too. Moreover, it is like a duty for these companies and web designers to make websites accessible for everyone equally. 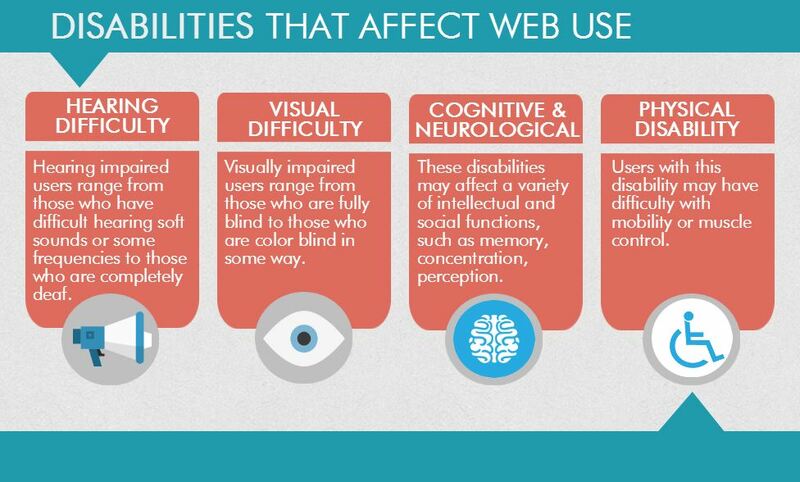 Thus, Worldwide Consortium (W3C) has introduced an initiative known as Web Accessibility Initiative (WAI). This initiative defines set of rules, policies and methodologies to make web easily accessible for everyone. Disabled people are overlooked while creating a website. There are very less number of web designers and companies that think of creating a websites easily operable by disabled people. 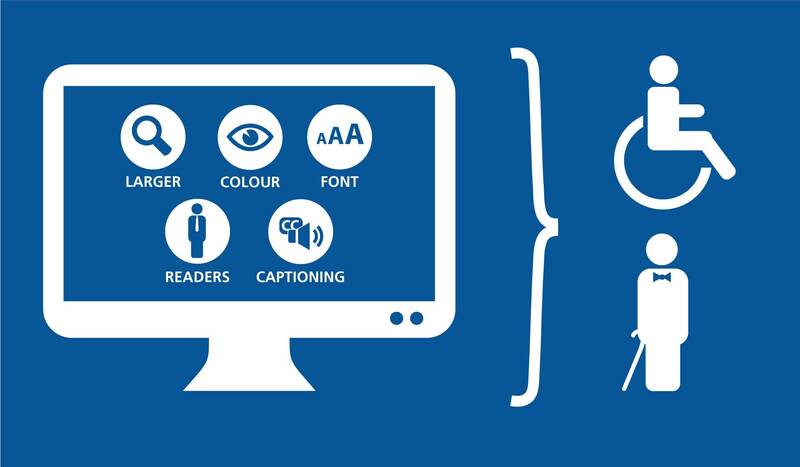 Let’s see why Web Accessibility is essential? • First of all, it makes a huge difference to the society by making the disabled people an equal part of it by being able to do everything that non-disabled people can do. • Having the disabled easily access your website, the usability of websites becomes very easy to deal with. • Your website will be noticed by the audience because of this, making it noticeable in search engine results. • The number of users will even increase drastically for your website. • It even helps in search engine optimization. • Vision Disability – People might have full or partial vision disability, color blindness, poor eye-sight etc. • Motor Disability – Some people suffer from diseases like Parkinson’s disease, muscle issues, paralysis attacks etc, resulting in the blockage of their hand moments. • Hearing Disabilities – Some people suffer from partial deafness or full deafness. • Dyslexia – Some people suffer from dyslexia resulting slow learning, unable to read, etc. • Graphics – Use of flashing graphics and wrong color combinations should be avoided as some people are sensitive to bright and flashy colors. People can get migraine issues or sinus due to sudden flashing of bright images as they can be sensitive to light. • Keywords – Keywords should be clearly stated as they can be difficult for visually impaired people and thus, the keywords should be highlighted with some different color or written in bold and underlined form. These people may even be using some kind of software so it should be easy for the software to locate keywords too. • Avoid Text – Avoid the usage of text within the images and specially use of Info-graphics should be prevented as these are very big problem for text-to-speech software to process. One can add captions of the text used in images so as to allow such software to read the text for the person. • CAPTCHA – If CAPTCHA code has been added, make sure that images displayed should be big in size and images should be displayed continuously. Text-to-speech software should be able to read the CAPTCHA code even. • Text-to-speech software – This software is really very essential for the people with vision issues as this software can read out the text. This helps users to navigate easily through the websites and web pages. • Speech-to-text software – This software is really very important for the people who have physical disabilities like muscular issues, paralyzed hand movements, etc. This software writes the text you dictate to it as well as performs the tasks you dictate to the computer system like opening some website or application. • Motion Detection & Recognition software – There are motion sensing & gesture sensing software tools that can be used in your computer to give instructions to your computer. • Text Magnification – This feature should be provided in the websites to make it easier for the low vision people to read. • Captions – Adding captions to the images with the text makes it convenient for the text-to-speech software to read. • Title should be self-describing – Titles should clearly explain what users are going to read and where would the hyperlinks take the person who clicks on it. • Headings accuracy – The heading used should be correct so that users should get a proper idea on what is coming their way. • Positioning of Elements – All the elements should be placed properly. For example, the most essential elements should be placed on top to grab the sight of the users right away. • Navigation – Users should be able to skip the navigation and go directly to the content they are looking for. • Font – The font being used should be simple and clearly understandable. Usage of stylish fonts should be avoided as it might make it difficult for the visually impaired people to read. • Color Combinations – Usage of very bright and improper color combinations can lead to issues in readability of the users. So use the color combinations correctly to keep it attractive for users. 1. The validation of HTML and CSS code should be firstly checked. 2. Automated accessibility should tested in order to check and remove errors in accessibility. 3. Keyboard testing should be done and the website should be accessed without mouse. 4. Screen Readability needs to be tested for software like text-to-speech. 5. Testing according to the target audience’s ability and needs. At the present day, accessibility is mandatory feature to be incorporated and has also been legally made mandatory by many countries. Web Accessibility is the feature serving a lot of purposes like providing feeling of equality to disabled people, bringing high amounts of traffic to your website and thus, improving business. Everyone knows that how rapidly the number of websites are growing and new technologies are being released. 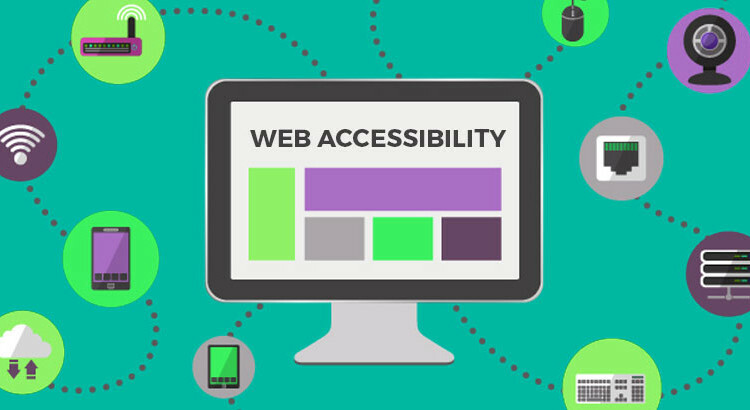 With current rate of growth of accessibility options, it is a surety that in coming years a lot of new technologies will be introduced, that’ll make web accessibility a major success.